TOLDEDO, O.H. 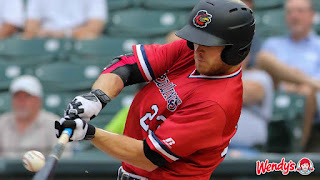 -- In a season full of offensive struggles, Thursday night in Toledo had to feel sweet for the Rochester Red Wings. The Wings exploded for 15 runs on 19 hits - including a pair of three-run homers - in a 15-2 win over the Mud Hens at Fifth Third Field. The Red Wings (55-66) wasted no time getting to work in their first and only visit to Toledo. The Wings collected seven hits and sent 15 men to the plate over the first two innings to build a 4-0 lead. The rehabbing Robbie Grossman drove in a run with a single in the first and then a sac fly in the second. Kennys Vargas and Willians Astudillo each followed with RBI knocks. The Mud Hens tried to answer right back in the second as they loaded the bases with two outs against the Wings opener, John Curtiss. But Fernando Romero entered in relief and induced a groundout to second to end the threat. After a couple inning lull, the Wings got back to work in the sixth, hanging an EIGHT spot on the board. Vargas drove in a pair with a single and then LaMonte Wade and Jon Kemmer each followed with three-run homers in the inning to extend the lead to 13-0! Vargas added a two-run homer in the seventh inning as he finished 3-for-5 with five RBI. Kemmer finished 4-for-5 with four RBI and three runs scored. Every Wings hitter in the starting lineup collected at least one hit and seven of the nine had multi-hit nights. Romero earned his fifth win of the season, allowing two runs (one earned) on seven hits over 5.1 IP. The Wings look to keep the bats hot in Game Two of the four-game series Friday night in Toledo. RHP Zack Littell (4-5, 3.55) is scheduled to get the start for Rochester.